Although I’m fond of using the following chart when writing or presenting about the benefits of electric vehicles, this comment made me realize that we’ve never written a deep dive (or even a shallow dive) on the economic benefits of EVs. So, here we are — below is an initial look at how electric transport could considerably boost certain economies — especially Europe and the USA. If anyone wants to take the idea further with California, Florida, the UK, Australia, or other locations, I’d love to see the results. Notably, if certain economies are benefiting from a switch to electrification (away from oil-based fuels), that means others are losing out. Oil-rich countries and billionaire oil barons are the most obvious parties that will have a tough time adjusting, but there will also be ramifications in many other sectors of society, as oil company investors lose cash, oil industry workers lose their jobs, etc. That said, it seems extremely likely that the net effect will be broader distribution of wealth — which I count as a good thing. 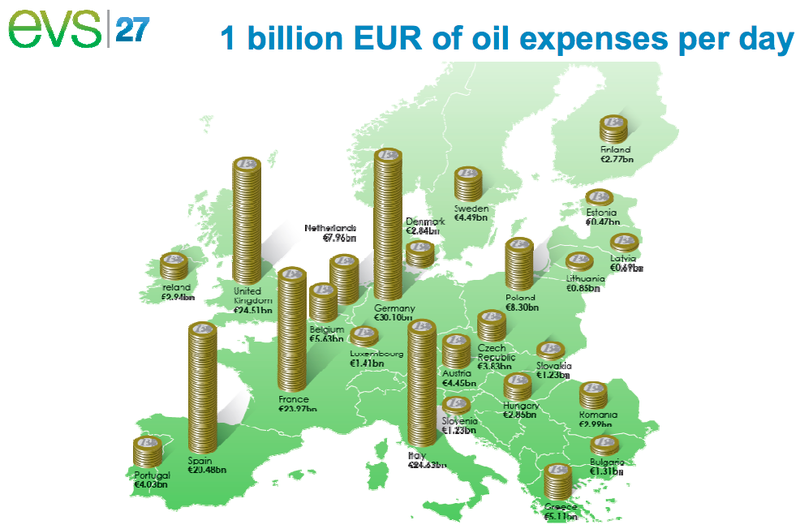 Starting with Europe, in the chart above you can see that at one point Europe was exporting approximately €1 billion of cash each day in return for oil. 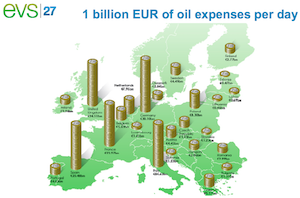 With oil prices falling, among other things, the daily price tag has apparently dropped to ~€525 million a day for the European Union (including the UK). That’s still nothing to scoff at. That comes to ~€200 billion per year. It’s approximately 1–1.5% of European Union GDP. 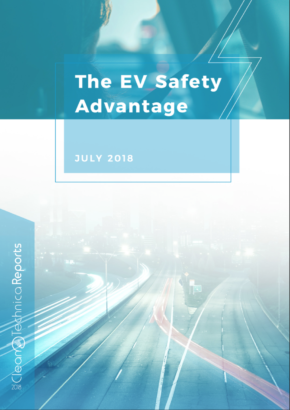 EU consumers wouldn’t simply save €525 million of cash each day if they switched over to electric transport — they will have to pay for the electricity to power their electric cars, buses, scooters, bikes, etc. However, the thing about electricity is that it’s generated locally or regionally — it can even be generated on the roof of your home (via solar panels, of course). 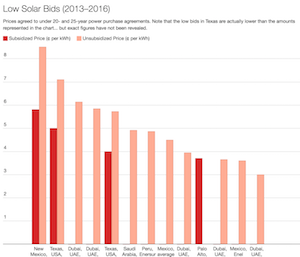 So, rather than sending €525 million each day to Saudi Arabia, Russia, Nigeria, the UAE, Canada, Iraq, Angola, Libya, etc., consumers would theoretically send cash to national or regional utilities, regional power plant owners, community solar and wind farms, or just their kids’ savings accounts. 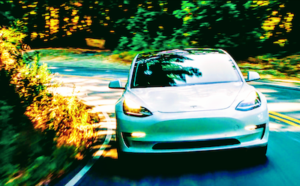 The total wouldn’t come to €525 million, though, since electric drivetrains are approximately 3–4 times more efficient than gasoline engines. Of course, it’s hard to have a strong clue as to how transport patterns will change, which electric cars will dominate, how much electricity will cost, etc., but we can be pretty certain we will be saving money on transport once we switch 100% to electrification. Michael Liebreich and Angus McCrone noted in a recent article that 7% of tax revenue comes from gasoline (petrol) and diesel taxes in Europe. Naturally, governments will need to find ways to get tax revenue from other sources to replace that revenue, but this matter is just about taxpayer money going to the government to go back to taxpayers via various services and infrastructure, so it’s not about net societal gains/losses from electrification. Of course, Europe also exports oil. The thought experiment above assumes that Europe leads the way in adoption of electric vehicles and is still able to export oil. As the whole world switches to electric transport and Europe’s exports lose out in the global oil market, you have to subtract the lost export revenue from the €525 million a day noted above. However, if Europe moves to EVs more quickly than others, it could theoretically export more oil than it is exporting now, which would boost revenue for a while, pushing the net benefit above €525 million a day. Either way, as it stands right now, Europe imports a lot more oil than it exports, so a global shift to electrification in which Europe was average would be a net benefit for the region. Beyond cutting €525 million a day in imports, there are many more economic benefits that I will discuss further down the article, after introducing the US situation. Don’t assume that’s the end of the story! In the USA, we import ~9,401,000 barrels of oil a day (compared to ~629,000 barrels a day in exports). Those 9.4 million barrels a day come to an import tab of approximately $425 million/day. That’s approximately $155 billion a year. In other words, we are in a similar boat as the EU. The countries we’re importing the most oil from (based on 2015 oil imports) are Canada, Saudi Arabia, Venezuela, Mexico, Colombia, Russia, Ecuador, Iraq, Brazil, and Kuwait. Much of that money isn’t going to make it back into the US economy in any way, shape, or form. $155 billion a year comes to nearly 1% of US GDP. That’s approximately 5 times more than Obama’s US Department of Energy FY2016 budget — $30 billion. It’s approximately 19 times more than the US EPA’s 2015 budget — $8.1 billion. Of course, the EPA’s budget could also be reduced substantially thanks to much less pollution from transportation, and that leads me into the final section. Air pollution from road transport costs OECD countries approximately $1 trillion a year in negative health effects (cancer, premature death, asthma, heart attacks, etc.). “Particulate matter is singlehandedly responsible for up to 30,000 premature deaths each year” in the US. How do you actually quantify 30,000 premature deaths? 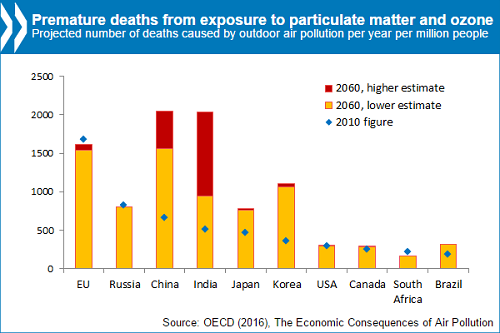 The “cost of outdoor air pollution” in the US simply in terms of premature death was estimated to be $500 billion in 2010, with about half of that cost coming from road transport. Again, that is the estimated cost only from premature deaths — it doesn’t include the costs of asthma, cancers that people survive, heart attacks that people survive, etc. The USA spends perhaps $75 billion a year on the military in order to secure access to foreign sources of oil and keep supply routes open (h/t EV Annex), further growing the economic and quality of life burden of oil-based transportation. National security is under much greater threat from global warming and climate change and the migration and wars that are likely to result. For more on that, see the video below the chart. 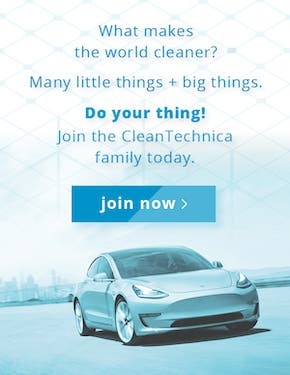 The health costs, the climate catastrophe costs, and the national security costs can all be cut by switching to electric transport (and cut further by switching to clean electricity production), and that could provide a great economic boon to the USA, Europe, and basically every country in the world. 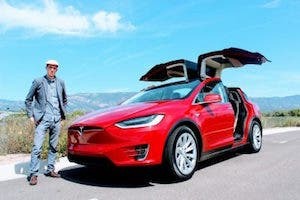 The amount of money we spend importing oil is alone enough to compel a societal shift to electric transport, but the economic benefits related to health, climate stability, and national security make electrification of transport one of the most obvious solutions we should be pursuing at the quickest pace possible.